Harriet Prince, a visitor from Manitoba dances at the Idle No More rally outside the Vancouver Art Gallery. Darla Goodwin wasn’t surprised when she first heard about the Enbridge Northern Gateway Pipeline. Goodwin, an organizer for the Idle No More Vancouver and a member of the Cree First Nation, points to a prophecy, made several hundred years ago and passed down through the indigenous peoples of North America, that describes a time when a great snake will travel across the country, poisoning the land, the water and the air. There is another prophecy that references a time when one of the races would lose its way, and it would be up to the others—the women in particular—to remind the fallen nation what is means to steward the land. She said her people were definitely not surprised when four women from Saskatchewan founded Idle No More in response to Bill C-45 and began a movement that now spans the country. Matriarchal First Nations societies are based on traditional teachings of the moon and earth as female beings, the Mother and the Grandmother, and the 28-day cycle. Goodwin’s grandfather was present for the signing of Treaty 4, but she said it was the clan mothers who decided what needed to go into that treaty. Now, with the Enbridge hearings taking place in BC and Attawapiskat Chief Theresa Spence entering her third week without food in Ontario, Goodwin said the struggles of First Nations across the country come down to one key issue: will Stephen Harper respect indigenous land rights? One of the biggest misconceptions non-indigenous Canadians have, she said, is that Crown lands belong to the government. “All the Crown land across Canada is owned by Aboriginal people and Canadians do not know that.” BC’s unceded Coast Salish territory, while not covered by its own treaty, is still Crown land, and by law, the federal government is required to have free, prior and informed consent from First Nations before undertaking any measure that affects the land. 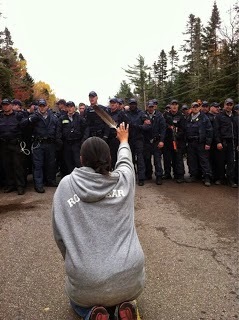 But Goodwin is quick to stress that this is not an indigenous movement. It’s not solely about a First Nations issue. It’s a labour movement and it’s a women’s movement. It’s a people’s movement in response to a human rights issue. This was immediately apparent today at the Idle No More Vancouver rally on the steps at the Vancouver Art Gallery where First Nations leaders and youth were flanked by members of the BC Nurses’ Union, CUPE and migrant justice group No One is Illegal.